Maryanna Hoggatt is a freelance artist, educator at Pacific Northwest College of Art, community organizer in GABRIELA Portland, and new momma based in Portland, Oregon. Her interest in art began as a child and her exposure to Filipino history and culture brought her to a better understanding of her Filipina American identity. Through organizing with GABRIELA Portland as a kultural worker, Maryanna creates prop work like posters and memes, while all her art’s detailed, colorful, and whimsical nature encourages the viewer to find magic while educating and inspiring in it’s message. When did you begin drawing, painting, creating? And when did you realize it is something you wanted to pursue? Like a lot of kids, I was drawing when I was very very young, but I knew by age 5 that being an artist is what I wanted to do with my life and I’ve kept up with it ever since. My inspirations are always evolving but span a broad spectrum of art: everything from children’s book illustrators (Chris Van Allsburg, Edward Gorey, Carson Ellis), fine art (Francis Bacon, Beth Cavener), comics (Bill Watterson, Taiyo Matsumoto), animated films or Henson live action films (Labyrinth & the Dark Crystal, Don Bluth films from the 80s like The Secret of Nimh), stop motion animation (Laika and Will Vinton), to political art (Emory Douglas of the Black Panthers, the UgatLahi Artist Collective of the Philippines), and of course, other Filipino artists - several of whom are included here! - and I’m always discovering more. I have special appreciation for contemporary illustrators who either primarily make political work or who manage to use their more “mainstream” platform and style for impactful political messaging. Political work isn’t limited to electoral politics - it’s a huge spectrum of issues which effect every single one of us. We have the power to bring attention to causes that need more support. Not a lot of artists dare to do this, and I think more of us should. Children’s book art and storytelling have always, always had huge influence in my work. My parents split up when I was young and we moved a lot between countries and cities, so I found stability and refuge in books. I’ve explored a lot of styles too, but seemed to really find my niche in creating stories around animal characters. Through that work I developed a love of sculpture art and 3D Illustration. How has being a Filipina American and learning about the country's history affected what you create? A couple years ago I experienced a big mental shift. I’m half Filipina, but I grew up completely separated from my Filipino family as a result of the divorce. I spent the majority of my life burying or ignoring my Filipino identity. It wasn’t until I was in my 30s that I realized just how whitewashed my lived experience was - everything from all the media I was consuming (the art world for so long has been dominated by white male westerners) to how I viewed myself. I was born in the Philippines, but I knew almost nothing about the country. I realized I was going through an identity crisis. Almost by accident, I starting reading about the Philippine American War after seeing a small clip about it in an American documentary. I had no idea. This time in US history gets almost no coverage in schoolbooks. I was hungry to not only learn more about Filipino culture and history, but also become an active member of our community. So I joined the Portland chapter of a grassroots organization of Filipino womxn called GABRIELA. 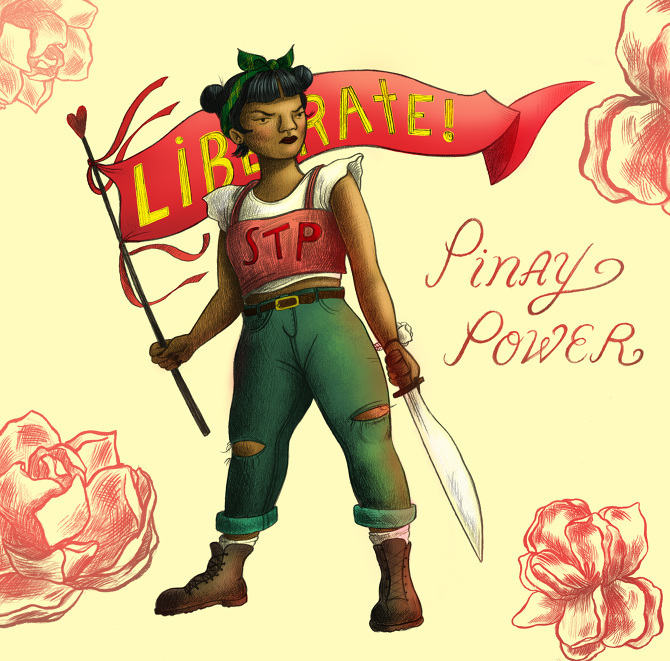 I did a deep dive into the history of the Philippines and learned about hundreds of years of colonization, the genocidal invasion by the US, a long legacy of revolution, and womxn’s resistance. After I joined GABRIELA, I understood that my experience of loss, confusion, and shame in Filipino identity was connected to so many other Filipinos, especially Pinays. I’ve never felt so whole until that point. And my Filipino identity, without a doubt, has a strong influence in my work now. I’m still navigating what means to merge both sides of me now: the American side who loves making children’s book inspired art, and my Filipino side, who wants to celebrate Filipino culture and uplift our revolutionary struggle. When did you get involved with Gabriela Portland and what do you find is powerful about the organization? I’ve been a member for about two years now. Throughout my life I’ve only encountered a few individual Filipinos, especially in Portland, which is mostly a white city. When i joined GAB it was the first time I’d been around so many Filipino womxn, and now, I’m part of huge network of Filipino community and organizers. It’s been a transformative experience. I can’t imagine my life without it now, and I am so grateful to be in the company of such passionate, strong, militant Pinays and to slowly learn what it means to be Filipino. The organization itself is part of larger international movement, struggling for the liberation of the Philippines. Our people are incredibly poor, but the lands are rich. So many of us are faced with the hard decision to leave home because of the conditions there, including my own mother. We are fighting for the return of land, resources, and true independence to the Filipino people. How do you connect your work to grassroots organizing for Filipino rights? I’m a kultural worker in our movement, meaning I create prop work in the form of posters or memes or I make personal work that attempts to educate on Filipino history and culture. Someday I hope our network of organizing can achieve the same level of agitating prop work as UgatLahi does in the Philippines. Last November I was able to go on an Exposure trip to the Philippines - it’s what we call a return to the motherland to understand the conditions of the people and for many of us, a reconnection to our roots. We integrated with different sectors, like the Lumad or the urban poor, to listen and learn. I also got to witness massive protests in Manila. UgatLahi created this mind-blowing kinetic effigy of Trump for the ASEAN Summit protest. It made International news. That’s the kind of kultural work I aspire to. I think my work can serve many purposes. I’ve gotten a lot of messages from parents who tell me their children love the storybook I published, TOLLY. That’s really special. I think children should always have a little magic in their lives. I hope my work on Filipino culture and history can help educate or inspire other Filipinos to learn more about themselves. So much of this information is hidden from us, or revisionist, and for those of us in the diaspora especially, it’s such a powerful thing to learn the true history of our people. Most of all, I hope to inspire people to dream big not only for themselves but for their communities. We live in hyper-individualized times. If we want a brighter future for the next generation, we’re gonna have to actively take part. Has becoming a mother changed what you want to create, what message your art tells? I’m a fresh new mom, so I’m only just beginning to walk this path, but absolutely - I’m now making art from a mother’s perspective. I think this season of my life will bring new creative energies (even though I am exhausted af). Do you have any upcoming events or pieces you are excited about? After a long hiatus from the art world to fully commit to organizing, I’m returning to my studio. I’m excited about just that alone. There’s a couple things brewing I can’t talk about just yet, but a few projects I’m planning to work on include a series on Filipino myths and diving back into sculpture/3D Illustration work. All images courtesy of Maryanna Hoggatt. 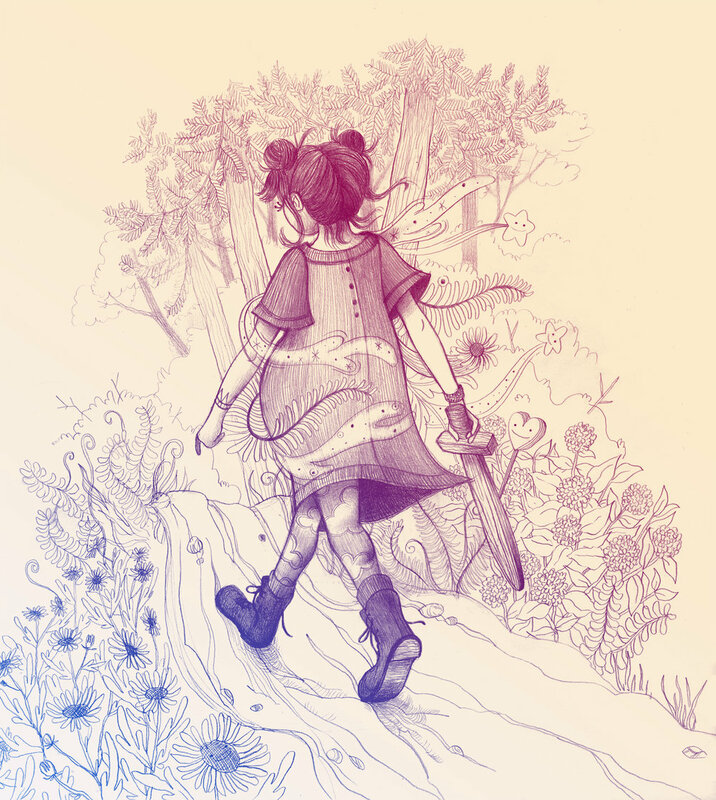 Profile photo of Maryanna by Nino Ortiz.